Random radio jottings: "But he's not given it"
That July day, I remember, I shared one of those heavy-duty radio microphones - they used to wrap themselves around your jaws like a cross between a dog muzzle and something you would expect to find in a war-time Lancaster over Berlin - with Alan Clarke of the fruity voice and northern authority and Maurice Edelstein, renowned for his scholarly summaries. We took it in turns to do 15-minute bursts of commentary that afternoon, and I was addressing the eccentrics who had found their way to a television screen when Hurst scored that crucial and much-debated third goal. 'I thought that hit the bar and went in. Maurice Edelston?' 'I'm not certain', added Maurice cautiously -and then 'Yes, it's given, it's given ... England are in the lead.' Rarely, if ever, has a football moment been so carved open, dissected more clinically or argued about more passionately, notwithstanding that little matter of an Argentine handball in Mexico 20 years later. I do recall slipping into Broadcasting House on my way to Wembley that day to pick up some bits and pieces and finding a single postcard on my sports room desk. My impact on the listening public was some way from causing headaches for the BBC post room! It was simple addressed: Moore, BBC, London. And the message was simple too: ' You'll never be as good as Raymond Glendenning as long as you live'. A splendid shot in the arm you must admit for any young commentator on his way to his most important assignment. 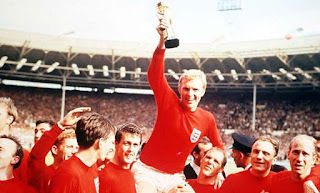 Incidentally, when that lunatic decision to take the Horse of the Year Show to Wembley Stadium in 1968 led to the whole pitch being dug up (it took another 20 years for it to recover) I plundered that square yard of turf where Bobby placed the ball, and transplanted it on my lawn in Bromley, Kent. I have since moved on, but one unsuspecting suburban gardener still tends to this day a small stretch of grass on which football history was made. The full off-air commentary - it appears that the BBC didn't keep the whole broadcast - has recently turned up. The match was covered by the Sports Service on Network Three, hosted that afternoon by John Dunn. The commentary can be heard here.